Today, various ones will attempt to honor the memory of Martin Luther King, Jr. Dr. King advocated civil disobedience to those laws and statutes that he felt conflicted with the human rights supposedly guaranteed in the Constitution of the USA (I use the term “supposedly” because with recent and proposed federal changes many of those supposedly guaranteed rights are being taken away). Dr. King further looked forward to a time when people would not be judged by the color of their skin, but by their character (there is little point in pointing out MLK’s many character issues in today’s post, so I do not intend to do so). The millennial rule of Christ on this earth will be such a time. Dr. King was born Michael King Jr., Jan. 15, 1929. 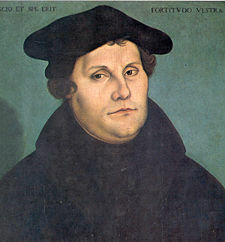 Five years later, his father changed both their names to Martin Luther, after the Reformation leader. Martin Luther took a different approach to try to attain his goals than MLK, plus his followers specifically condemned those who looked forward to the millennial rule of Christ on this earth. Article XVI: Of Civil Affairs. Of Civil Affairs they teach that lawful civil ordinances are good works of God, and that it is right for Christians to bear civil office, to sit as judges, to judge matters by the Imperial and other existing laws, to award just punishments, to engage in just wars, to serve as soldiers...They condemn the Anabaptists who forbid these civil offices to Christians. It should be noted that some of those called Anabaptists were in the Church of God (please see the article The Sardis Church Era). There would have been no reason to condemn groups for specific teachings if those groups did not teach them. Hence Martin Luther, held vastly different opinions than Martin Luther King, Jr. And the Bible for that matter. Sola Scriptura or Prima Luther? What Did Martin Luther Really Believe About the Bible? Though he is known for his public sola Scriptura teaching, did Martin Luther’s writings about the Bible suggest he felt that prima Luther was his ultimate authority? Do you really want to know the truth? This entry was posted on Monday, January 21st, 2008 at 6:52 am	and is filed under Church History.